As the foundation of Artists in Residency of domestic and overseas, TAV/THAV not only provide the space of creation and life, but more importantly produce more artistic creation or interactive communication of life experience with local people. 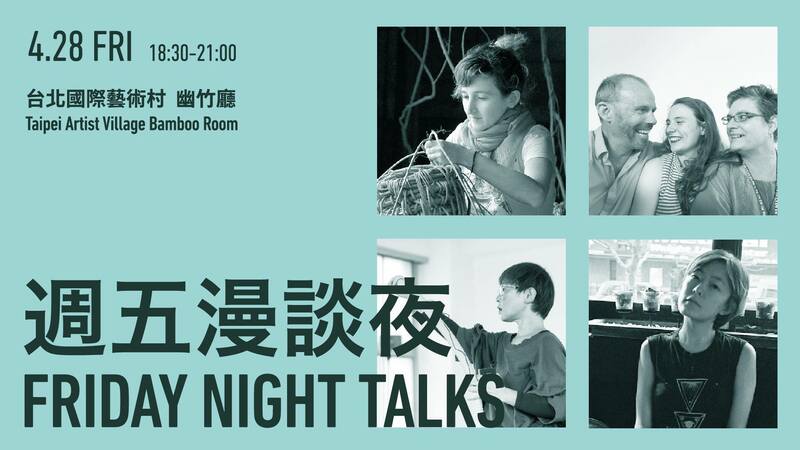 Therefore, TAV/THAV will hold another Friday Night Talks of the 2nd season at TAV Bamboo Room on April 28(Fri.) ,6:30pm-9:00pm, and will invite the 2nd season residency artist to have a talk, including Elena Redaelli、Keiko Uenishi、Cici Wu and F4 Collective. The talk will be conducted by Lee Yen-Yi, who is an independent curator, also the founder and editor of independent art zine, HAGAI. These residency artists will talk about the experience during their creation process in a relaxed way, and share the feeling of their residency in Taipei. Welcome to TAV Bamboo Room and join the Friday Night Talks. ●How to enroll／Capacity: 30 people. Please Fill out a google form https://goo.gl/9NQADh by 27th April to secure a seat. ●The talks will be conducted in English.